Whether you are restoring house windows or updating them completely, Modernize is here to help you find replacement windows in Houston, TX. Speaking with local window professionals will help you find the best solution for your individual home renovation needs. Get free quotes from the best window replacement contractors in Houston, TX, ready to complete your project. If you are ready to invest in high quality windows that are built to last for your home in Houston, there are a few things you need to know before you buy. Brand new windows are a significant investment, and it is not an investment you will want to make without thorough research. The right windows will save you money over time by increasing the resale value of your home and lowering your monthly utility costs. Replacement windows are not “one size fit all”. In fact, the best windows for your home will be windows made specifically with Houston’s climate in mind. In addition to finding windows that will be energy efficient in your Houston home, there are permit and building codes unique to Houston that must be considered before making a purchase. In this article, we will lay out the basic information you need to understand before buying new windows, the city requirements for replacing windows, options for paying for windows in Houston, and how to find the right windows for the climate. It doesn’t matter where in the United States you live, there is basic knowledge you need before purchasing new windows for your home. First, you will need to determine if replacement or new construction windows are best for your project. Replacement windows are unique in that they are custom built to fit exactly in the space left behind by an old window. New construction windows are designed to attach directly to exposed studs and frames during new building or remodeling projects. The second thing you will want to consider is how your new windows will need to function in your home. If your main goal for your windows is functionality, double-hung windows may be the best choice. Made of two vertically hung sashes that are fully operational, double-hung windows can open from the top or bottom and each sash tilts into the home for easy cleaning of the exterior pane. If you are replacing non-operational windows in your home, most window brands have a variety of stationary arched or picture windows in multiple shapes and sizes. Once you have selected a window model that will fit best in your home, you can further customize your window until it fits perfectly with your home’s decor. Window frames are available in wood, vinyl, aluminum, and fiberglass and each of these materials is available in numerous color and finish options. You can further customize your windows by choosing from multiple hardware finishes and glass grid designs. Unless you will be installing your windows yourself, you will want to find a contractor who meets the basic requirements put in place by the City of Houston. All contractors making major alterations to homes must obtain a general builder’s license from the State of Texas Department of Housing & Community Affairs. Before beginning work, contractors in Houston must purchase a building permit from the Houston Permitting Center. Additionally, the city requires any contractors working within their city limits to sign a document called a sworn deed restriction affidavit. This document is a basic agreement to follow all construction guidelines in the building permit. More information about purchasing permits and signing the appropriate agreements can be found on the Houston Permitting Center website or you can call the office at 832.394.9000. All contractors who have hired employees are required to carry workers’ compensation insurance. This insurance covers any costs associated with an employee’s injury while on the clock, including medical expenses and missed work time during their recovery. At this time, the City of Houston is not offering rebates or incentives to homeowners who have installed energy efficient window replacements. Additionally, all available federal tax credits expired in 2014. Because of this, homeowners will need to use more conventional means of paying for their window replacements including saving up to pay cash, applying for zero interest credit cards, or applying for a home equity line of credit. Even though window replacement costs vary greatly based on the chosen brand, materials, and operational style of the window, a loose budget can be drafted based on cost estimates provided below. Even though there are few discounts or rebates for available for new window purchases, energy efficient windows may pay for themselve over time. Many of the energy companies in Houston offer utility discounts to homeowners who have installed energy efficient windows in their home. What isn’t made up in utility savings may be recouped if the homeowners chooses to sell. Houston homeowners may see as much as a 85.5% return on investment from their new window purchase. 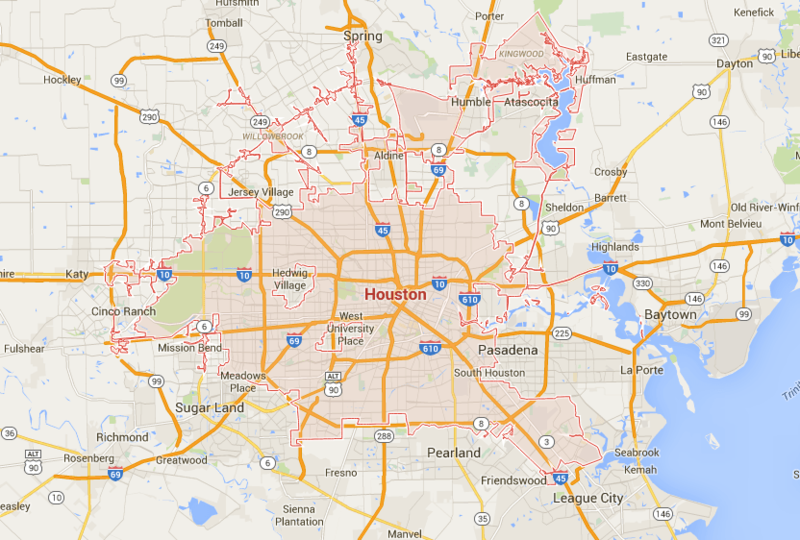 According to ENERGY STAR®, Houston is located in the Southern Climate Zone. Typically, cities in this zone heavily use their cooling system and rely very little on their heating system. The weather in Houston is characterized as hot and humid. During the summer, the average temperature is 84.6 degrees and the winter temperature averages at 53.1 degrees. Since the weather is hot and humid in Houston, homeowners should only purchase windows that are specifically designed for their climate. The easiest way to understand the energy efficiency of the windows you are looking at is by reading the ratings on the National Fenestration Ratings Council (NFRC) label that is located on every new window. The main numbers you should consider on the label are the U-Factor and Solar Heat Gain Coefficient ratings. The U-Factor is a number that represents how much heat can enter or leave a home through a window. When the U-Factor rating is high, that means the window is inefficient, allowing too much heat to pass through the window. In Houston, ENERGY STAR® requires all replacement windows purchased to have a U-Factor of 0.40 or less. The Solar Heat Gain Coefficient is a number that represents how much solar radiation can pass through a window. If the climate is cold, a high SHGC is beneficial because it provides free heat to the home. However, in a climate as hot as Houston’s, a low SHGC is important because solar radiation can overheat a home. In Houston, ENERGY STAR® requires a SHGC rating of 0.25 or less. Before purchasing windows for your Houston home, inquire about the condensation rating of the window. Because Houston has a humid climate, it is important select a window that can resist excess moisture in the environment. A higher condensation resistance rating represents a window that is more resistance to humidity. When you live in a climate as hot as Houston’s, investing in ENERGY STAR® compliant windows can save you significant money on your heating and cooling costs each year. In fact, when you buy energy efficient windows, you may save as much as $266 in utility costs each year. Saving money isn’t the only advantage to your purchase, you will also be living a more sustainable way of life by lowering your dependence on unsustainable energy sources to heat and cool your home.